UNITED NATIONS, Apr 10 2013 (IPS) - As the global South claims a greater share of the world’s GDP, is it also progressing in terms of overall human development? How has this southward tipping of the scale affected the dynamics of international trade? What is the role of global governance in mediating this period of change? 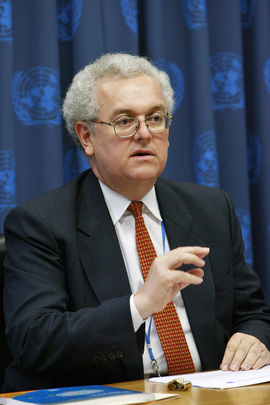 The 2013 U.N. Human Development Report entitled, “The Rise of the South: Human Progress in a Diverse World” and its lead author, Khalid Malik, suggest that as the South grows economically, its citizens experience an “expansion of human capabilities and choices” that is leading to further social and political development. Others are more sceptical of the purported “rise of the South”, pointing to the world’s widening income inequality, the lack of correlation between economic growth and equitable and sustainable socio-economic policies, and relatively unchanging global power dynamics. On Monday, Columbia University’s Committee on Global Thought hosted a conference to discuss these issues with panelists including Malik, U.N. Ambassador Luis Alfonso de Alba of Mexico, and Dr. Jose Antonio Ocampo, a professor at Columbia’s School of International and Public Affairs and a former U.N. Under-Secretary-General of Economic and Social Affairs. Ocampo called Malik’s characterisation of the rise of the South as a “tectonic change” a bit strong. Excerpts from IPS’s interview with Ocampo on the impact of newly rising economies in international trade and global governance follow. Q: Both you and Ambassador de Alba agree on the importance of multilateral global governance in terms of human development. Ambassador de Alba addressed the shortcomings of current institutions and, in particular, the U.N.’s inefficient decision-making processes. Discuss what productive, multilateral global governance would look like. A: I have written extensively on the G20 and my perspective is that these informal institutions, which I call “elite multilateralism”, are not the best form of global governance. I like “the G’s” when they are part of multilateral institutions. Global governance derives its legitimacy at the global level just as governance does at a national level, from universality. You have to have universal membership. For that purpose, the best way for these “G’s” to work is within a formal multilateral setting. At the same time, I agree that you have to have effective decision-making mechanisms. Smaller decision-making bodies, in which everyone is directly represented, are fundamental. In all democracies, decisions are taken by a limited number of actors at the end, but those actors have to be representing all of the membership. Q: What is the state of South-South trade relationships today? What constitutes an ideal South-South partnership that allows for progress toward a more advanced, dynamic economy? A: There is one sort of South-South trade that is really part of North-South trade. For example, Southeast Asia is producing parts and capital goods that are assembled in China and then exported to the U.S. In the case of China-India, it’s a huge deficit for India and surplus for China. There is a second China-centered relationship, in which China essentially imports raw commodities and exports manufactured goods. I would say, for commodity producers – i.e. sub-Saharan African, South America, and some of the Middle East – that’s an opportunity. But it’s still a very imbalanced trade relationship. In the long-term, you have to diversify away from that. There is a third type which are legitimately South-South flows in which you have, more or less, a balanced relationship. For example, the inter-regional trade in Latin America is one relationship of that type – it starts and ends in developing countries. I think that’s the most positive of all, but it’s less common. Q: As these newly rising economies close the income gap that separates them from developed countries, what do you think characterises fair and mutually-beneficial North-South partnerships? A: In the past, the North-South relationship was considered to be an asymmetric relationship in which the North had to support the development of the South so it could cash out. I think that concept has become obsolete because of the heterogeneity of developing countries. Ambassador de Alba mentioned this almost sacred principle of “common but differentiated responsibilities”. In the past, developing countries wanted to be treated according to the second part of that principle – “differentiated” – and I think, as de Alba pointed out, the “differentiated” still has to be considered today. Even major emerging economies are developing countries – they are technologically dependent, they still have a large share of the labour force in low productivity activities, and the GDP per capita is still a fraction of that of developed countries. So they have a right to be treated with some differences internationally. But they are, at the same time, responsible and the responsibility those countries have is very important. Q: How have Southern governments been an obstacle to human development and, on the other hand, what should they be prioritising in order to create positive conditions for growth? A: The basic problem is that power ends up in the hands of the elite that uses power to further its own interests. This has been associated with developing countries, but it can also happen in developed countries, particularly in the financial sector. There has been a change in that regard during the recent crisis; now there is a bit more hope that financial policy will be detached from financial interests. Successful human development strategy has to include very active social policy, including education, health, and social protections, and at the same time very active economic development policy, particularly the generation of employment. We have seen so many cases of countries that have improvements in education and when an educated labour force comes to the market, there is no employment to absorb that population. You have to have an active social policy but also an active economic policy and the basic connection between the two is called employment.